The last few years have been difficult financially for a wide range of people all across the globe. The market crash led to a freeze on hiring and vastly elevated unemployment numbers. And the recession that set in has been slow to ease up. Many people found themselves underemployed or unemployed for six months, a year or even longer, and only recently have job prospects began to brighten here in the United States. Regardless of how well you plan for lean times this sort of prolonged slump can whittle through savings, emergency funds and investments and leave you scrambling to make ends meet. Add on to that the rising costs of living and stagnant wage growth, and you’ve got a real recipe for disaster. Desperate times call for desperate measures, and some folks find they must consider a car title loan to pay upcoming bills. Here is a quick look at exactly how a car title loan works, so you can decide if it is a viable option for you. Basically, a car title loan allows you to use your car, truck or motorcycle as collateral in a cash loan. Obviously, you have to own your car outright. If you are leasing a car the bank or leasing company holds the title to the vehicle, so obviously you cannot go down this road. But if you’ve fully financed your car and now own it, you can put up that tile as collateral. You bring the title to a lender who will determine the value of your vehicle, and then offer you a loan against that value. 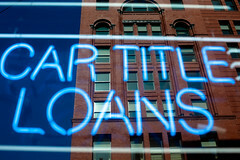 In most cases, a car title loan is a short term solution. This is a choice you would make in an emergency, when no other options present themselves. The primary reason for this is that the terms offered by lenders on car title loans always come with a quick repayment period. Generally you’ll have to pay back what you took within thirty days. Some of the more reputable lenders will allow you to extend for another thirty day period, but that’s generally the extent of it. Some disreputable lenders may give you even more time and charge you exorbitant fees, but state regulations usually make this illegal. Regardless of the length of the loan, you’ll have other serious stipulations to consider. First of all, the interest rates on a car title loan are frequently very high. In this way they very much resemble payday loans, which allow you to bring a current pay stub into a store and get cash several days in advance of your paycheck. In both cases you’ve got interest rates far higher than what you’d find with a credit card, even if you don’t have stellar credit. It’s not quite at mafia levels, but it will surely feel like exploitation. The interest rates may be the slightest bit better than some of the other unsecured loans you could look for, because you have the title to put up. But it will still be painful. Also, you’ve got a massive amount of risk to consider. As the name implies, your car title is the collateral in a car title loan. So if you fail to repay the lender in the timeframe and at the rates you agreed upon, they could take your car away from you. And you won’t be able to get it back, as they will then have the right to sell your vehicle to recoup the loan. So while you’ll have that quick influx of cash, you could end up with no car next month. That means no way to get to work, and far worse problems than what you faced before. The rules may be slightly different with California, New York or Texas car title loans, so make sure you check with your state’s particular loan regulations. But this major risk is always a factor, and should be enough to encourage you to investigate alternative options whenever possible.